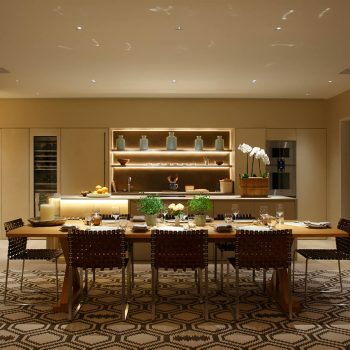 Before you even think about adding food and company into your dining room, you must first think about adding the right mood and this is best achieve with great dining room lighting. 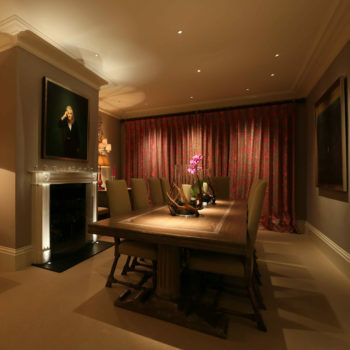 The impact of lighting cannot be underestimated, a totally undecorated space can be made to be moody as lighting can focus on what we want to see and conceal what we don’t. A beautifully decorated house can be a disaster if badly lit too bright and no lighting control. 1.The key for successful dining room lighting is to create drama by focusing on the centre of the table with a 10° warm white LED to highlight flowers using for example the Polespring LED. Lighting artwork and potentially focusing light on features, whether a textured wall or a piece of art. 2.Put your lights on a control system that allows you to dim the lights and have them on different circuits. Put the light over the centre of a table separate to decorative lights and separate from any feature lighting. By having a variety of effects, it is easier to change the mood. 3.Decorative lighting such as chandeliers and wall lights can add warmth to the room and create a more intimate setting. Though avoid decorative lights that are non-dimmable or use a cold LED light source which does not match the rest of your lighting. 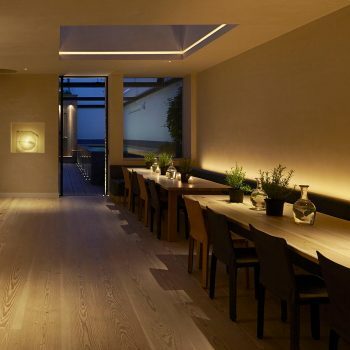 Be sure to add some narrow beam Polespring LED downlights as seen here to light the centre of the table and consider complimenting this with some Lucca uplights to your shutter boxes. 4.If you are looking to achieve a more minimalist look for your dining room with no decorative lights, consider uplighting behind your banquette using Contour HD24. This soft uplight will provide an indirect source instead and reflect warm light into your dining room. 5.Don’t forget candles, these provide an unbeatable softness and dynamic appeal. 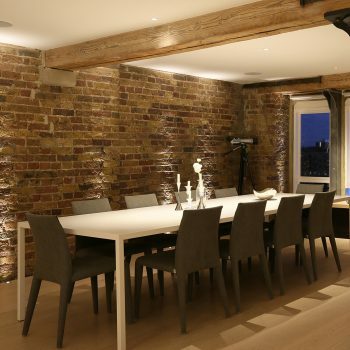 If your dining table is under a skylight, add lighting around the upstand to create a twinkling effect above the table. 6.Avoid grids of downlights. Be careful where you position these. 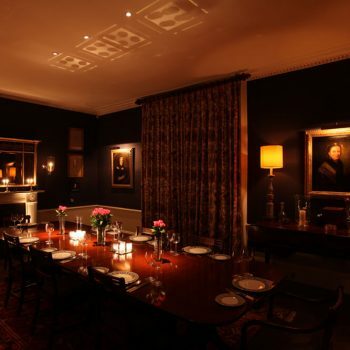 Choose a narrow beam Polespring over the centre of a table and never over one’s head. 7.Avoid only one light source as it is difficult to create a mood i.e. just pendants or just downlights. Good lighting requires a variety of effects. Here shelves are lit with Contour HD27 to provide a soft background glow whilst the centre of the table is lit with narrow beam Polespring downlights.